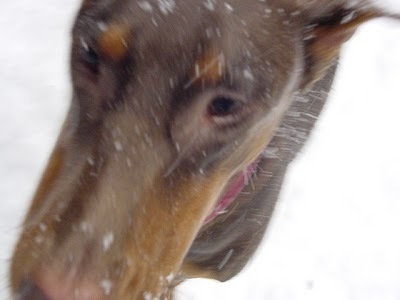 In Save Karyn, I briefly wrote about my old neighbors' dogs, Uwe (Ooh-vay) and Jazzy. 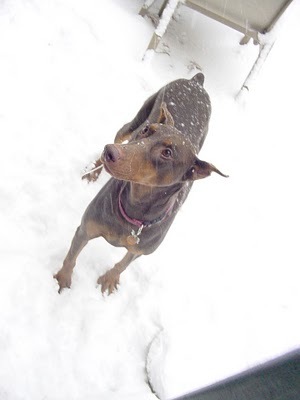 Uwe, a big red Doberman and the sweetest thing ever to live, died this past weekend. Sometimes, when my neighbors would go out of town, I'd dog-sit for them. At night, when I'd go to sleep, Uwe would hop in bed and sleep next to me. He wouldn't curl up at the bottom of the bed by my feet, but put his head on the pillow and sleep next to me long-ways, like a person. He wasn't allowed to sleep in the bed when his mommy and daddy were home (probably because there was no room), so it was his treat and our little secret. Uwe was fascinated with Beverly when I got her. She was just a wee little thing, 2-1/2 pounds, and he would smell her and lick her... he was her first real boyfriend.